Paris is the capital of France and one of the most popular tourist destinations in Europe. It's famous for its beautiful architecture, rich history, and scenic views along the River Seine. Paris is also an expensive destination, and accommodation is no exception. If you're hoping to keep costs down, a hostel might be your best option. There are a wide variety of hostels in Paris, and each has its own style and personality. If you're looking for a quiet setting where you can be assured a good nights sleep, then the hostels below may be a good option. A good hostel for backpackers, solo travellers, and female travellers. Le Village Hostel Montmartre is a friendly place to stay that will quickly become your home away from home. It's located in the middle of Montmartre, and is about a ten minute walk from the famous Sacre Coeur of Montmartre. The neighborhood is quaint and charming and it's fun to just get out and wander around the streets. The location is also very central, so it makes exploring the city very easy. Le Village Hostel has a nice terrace where you can enjoy the views or read a good book. Every morning they provide a Parisian breakfast and if you want to cook your own meals, there's a kitchen available to guests. There's also a pub attached to the hostel where you can hang out and meet other guests. This hostel has single, twin, double, and three or four bed private rooms available. There are also dorms that sleep four, six, or twelve people. Both co-ed and female only rooms are available. A small and affordable hostel in Paris. Pariscoree is located just a short walk from metro line 7 station Le Kremin-Bicetre, which is about half an hour from the center of Paris. It's about a fifteen minute metro ride to the Louvre and Notre Dame, and is about 20 minutes from the Opera. This is a small and simple place to stay that has a friendly and welcoming atmosphere. There are just three rooms in all and each room is kept clean and well furnished. The rooms are dorms that sleep either four or six people. There is one co-ed room, one female only room, and one male only room. There's also an outdoor terrace if you want to spend some time outside. Breakfast is included in the price of the room and free wi-fi is available throughout the hostel. There are also laundry facilities available. If you're looking for a quiet hostel in a more authentic part of the city, then this is a good option. FIAP Jean Monnet is located in the 14th district in the center of Paris. 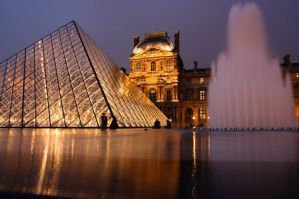 It's about twenty minutes from the Latin Quarter, the Louvre, and the Eiffel Tower. The hostel is quite large, with 480 beds in total, but it has a generally quiet and relaxed atmosphere. The beds are split between single, twin, triple, and quad rooms. Each room has its own shower and toilet, and breakfast is included in the price. This hostel is in a quiet neighborhood that is a bit removed from the major touristy areas in Paris. It is close to a metro station, which makes most of the city easily accessible, despite its more quiet location. There's also an on-site cafeteria where you can grab a decent lunch or dinner. If you're looking for a clean and comfortable place to stay in a quiet neighborhood then this is a good option. It's reasonably affordable and makes a decent base for your time in Paris. Beautiful City Hostel is another friendly and comfortable place to stay in Paris. It has a modern and colorful design and its atmosphere is welcoming and friendly. It's located on a quiet street in Paris that is close to the Parc de Buttes-Chaumont. It's also right in the middle of the Belleville district near many bars, shops, and restaurants. Despite it's location on a quiet street, you won't have to go far to find good food or entertainment. The hostel has 27 rooms in total. There are single, double, and twin private rooms as well as dorms that sleep three, four, or six people. There is wi-fi available throughout the hostel and a buffet breakfast that is available between the hours of 8 am and 10 am.